There are four independent panels, each with its own scenery and characters. Man 1 is holding a half-open door with his hand, as if about to exit. Man 2 is on his back on a table to which he is tied. A laser beam pierces the table between the man's feet. Man 1: No Mr. 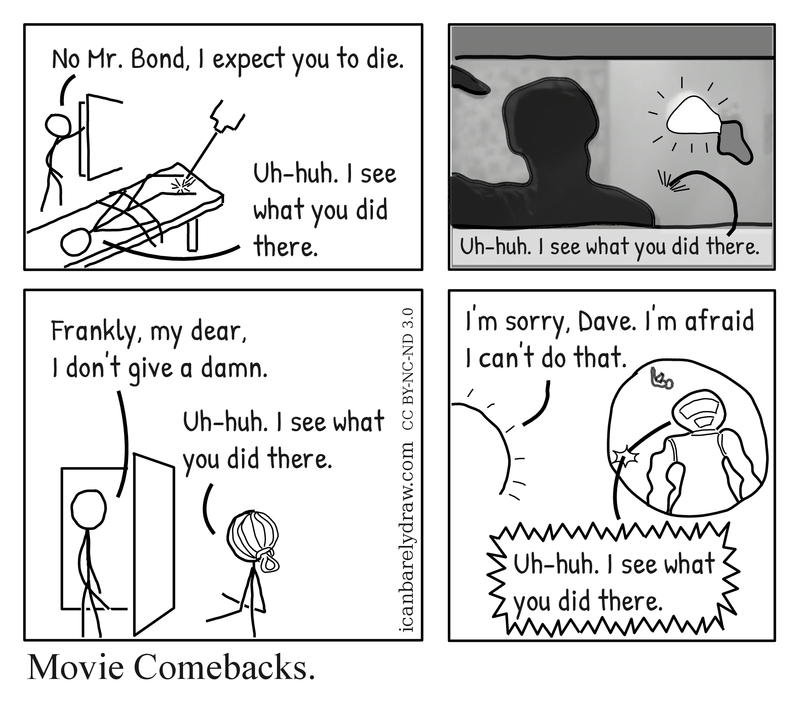 Bond, I expect you to die. Man 2: I see what you did there. A silhouette of a man is seen and he appears to have an object in his hand that could be a blunt weapon or a knife. The hand with this weapon is raised as if ready to strike. A light in a wall fixture shines brightly but the rest of the scene is mostly dark. Voice from the darkness: I see what you did there. A man stands near a half-open door, as if about to exit. A woman stands nearby with her face towards the man and her back towards the reader. Man: Frankly, my dear, I don't give a damn. Woman: I see what you did there. To the left is a round glowing object. To the right is a circular opening through which can be seen an astronaut close by. Behind this astronaut, far in the distance, is seen a small floating upside-down figure of what could be another astronaut. Voice from round glowing object: I'm sorry, Dave. I'm afraid I can't do that. Astronaut close by: I see what you did there.